A visit to the Waffle House is always an exciting outing, not only enjoying the delicious variety of waffles on offer, but also discovering the hidden delights that exist just beyond the bridge in Tanglewood Forest. Tanglewood Forest is a preserved piece of the original sub-tropical forest that used to surround the iBilanhlolo River. Not only does it contain gorgeous old, knotted and twisted trees, but it also contains a few interesting gems for those willing to explore its depths. 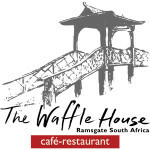 A cement path leads you from the Waffle House to Ramsgate beach alongside the lagoon. The path passes a couple of stone benches and seating areas that allow you to take a break and enjoy your surroundings. 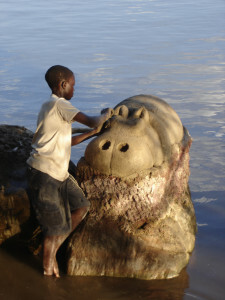 A little archway leads to a stone jetty where you may be lucky enough to spot our resident hippo (don’t worry, he is made of cement). A twist in the path leads you to a mock castle/fort and its massive wooden door. What lies behind it? Well, that is for you to decide. A few more twists and turns take us to the resonant circle and this is something you have to try! You stand in the centre of the circle and facing South West, say your name. You will hear it’s echo ringing in your ears, just one of the mysteries of this beautiful place. There is always something new to see and explore, so on your next visit be sure to take some time out to have some fun. Hi! Please explain to me how the resonant circle works.. Or where I could find some information about it, I’m astonished! Hi Sean, it is awesome, isn’t it . We haven’t been able to find out much more about it. We are hoping to hear back from the guy that designed it, will keep you posted.